Tetris, meet UnblockMe. I can’t say I’ve ever really given a lot of thought to how to improve sliding block puzzles. They’ve basically been around for as long as blocks, so I sort of figured that there’s a reason for it’s relatively classic form, but the developers of Move It! are under the impression that what this incredibly ancient puzzle type was really missing was differently shaped blocks, so…that’s their gimmick. To be fair, Move It! isn’t bad as block puzzles go, plus, it’s free…ish, so y’know, it’s not like you need to make an investment in the game. Rather than releasing separate pay and free versions, Move It! decided to consolidate its efforts into one app. So instead, you get you a ton of levels for free, a few ads sprinkled throughout, and the option of making in-game purchases for more level packs at $0.99 a pop. The ads were about as unobtrusive as you could want, but I still found them mildly off-putting, as there’s no indication that the ads ever go away, even if you end up buying all the level packs. That said, you probably won’t ever need to buy all the level packs, since there are a lot of free levels, and they’re really quite challenging. I like to think I’m pretty decent at puzzles, but some of these definitely had me sweating, but I’m not convinced that it was the addition of different shapes that really ups the challenge factor. 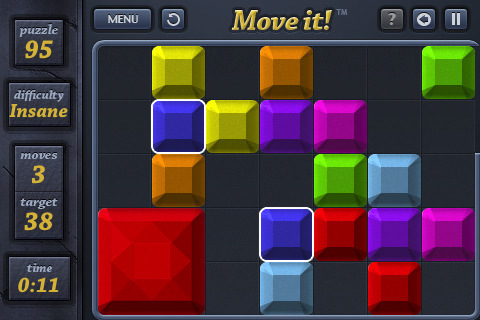 Visually, the game is much more colorful than UnblockMe, since Move It! 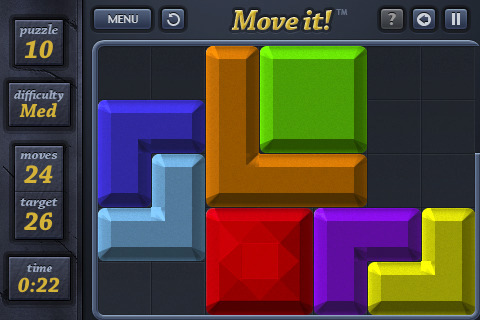 is taking its graphics cues from Tetris. There are lots of different blocks of all shapes, sizes, and colors, and it’s not just the classic four-block tetrominoes. You’re moving around everything from single block pieces to big, unwieldy five block ones. The most important piece is the 2×2 red block that you’re always trying to get out of the grid, and on a few levels, that seems all but impossible. There is a hint system, but I found it almost entirely useless, so just expect to experiment a lot. If you’re really good and want to give yourself an additional challenge, you can shoot for the various trophies on every level by freeing the red square in a certain number of moves and in a certain amount of time. The game always displays the optimum number of moves for a level, so you at least know what you’re shooting for, and there’s no penalty if you move too often or take too long. Bottom line: Move It! is free, fairly challenging, and comes with a generous number of levels, but it’s still just another sliding block puzzle and nothing particularly special. It’s not quite as elegant or satisfying an experience as UnblockMe, but it’s certainly functional and about as affordable as you can get, so if you’re looking for a cheap puzzle fix, you could certainly do worse. AppSafari review of Move It! was written by Tracy Yonemoto on October 13th, 2010 and categorized under App Store, Board, Free, Games, iPad apps, Puzzler. Page viewed 5626 times, 3 so far today. Need help on using these apps? Please read the Help Page.